In the last week two reports on the value of church social initiatives in local communities have received coverage in the national media. On Thursday, Andrew Brown in the Guardian wrote an outstanding article on the role some churches are playing in supporting those in desperate financial need in their communities. The Government is increasingly keen to promote religious organisations as delivery mechanisms of social services, whilst three influential think tanks, Demos, Res Publica and the Centre for Social Justice have all been calling for increased acceptance of faith-based community initiatives by government and local authorities. Brown also refers to the report published last month by the Church of England’s Church Urban Fund (CUF) which found that 1 in 10 Anglican parishes offer organised help with debt and homelessness, and about a third of them offer informal help. address at least one social need in their community. and in response have provided informal support. 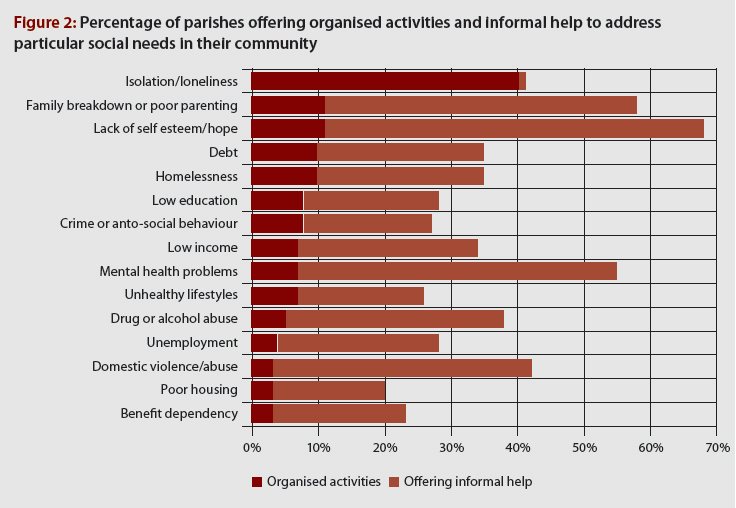 Parishes based on council estates and in the inner city are most likely to be active in the community: 80% of parishes on council estates run activities to address at least one social need, compared to 50% and 47% of parishes in commuter rural and other rural areas respectively. The other report to get a mention was the Jubilee+ National Church Social Action Survey for 2012. Figures from this were highlighted in John Bingham’s piece in the Telegraph also published on Thursday. The survey was cited in relation to Baroness Warsi’s comments in a speech she gave discussing the need to defend the right of Christians, Muslims, Jews and others to publicly practise their faith insisting that “people who do God do good”. Warsi’s assertion that ‘people who do God do good’ is backed up by the statistics presented by the Jubilee+ report. Jubilee+ is an initiative of the New Frontiers churches network. They contacted several thousand churches of all denominations in the autumn of 2012 as a follow-up to a similar survey carried out in 2010. Hours spent by volunteers in UK Churches on local social action initiatives have increased by 36% in two years to 98 million hours. In spite of the current economic problems, funds given by UK Church members that were spent on social action initiatives have increased by 19% in two years to £342 million. There has been a rapid diversification by churches – the average number of social action initiatives undertaken by a Church has risen from 5.7 to 8.2 – there appears to be a rapid diversification in social action initiatives along with an increase in resources and also putting existing effort and resources to new uses. Only 26% of the churches in the sample received any outside funding. This averaged £12,382 per church, a 7% decrease in outside grants over 2010. These grants would not cover all the initiatives they are involved in. It also means that 74% of churches are financing social actions totally themselves. There are a few important points to be drawn from all of this. One is that anyone who thinks that Christians should be keeping their faith to themselves and stay out of public life, as the National Secularist Society advocate, has no idea how big a gaping hole in community work this would leave nationally. To even suggest such a foolish idea displays a high level of ignorance and intolerance that really does not deserve any respect. Instead, the increase in provision by churches over the last couple of years strongly suggests that their desire to serve the communities they are grounded in is driven by compassion and awareness of local needs. Whereas most charities are seeing their incomes fall, giving by Christians to their own church social projects has increased substantially. Christians are filling the gaps, as Andrew Brown reports, that welfare cuts are creating. I would like to suggest that one of the consequences of the economic downturn is that churches are becoming more socially aware and that the challenge of meeting the needs of people on their doorstep is creating a renewed movement in Christian circles as the Church once again explores what its role in society should be. A question that leads from this that I don’t want to go into now in depth, but needs highlighting, is just how much Churches can be expected to do, especially by government. Churches deliver social action because the Bible calls them too, but also because it is a practical way of demonstrating God’s love and blessing others. Being expected to provide such provision to make up for the state’s failings is not a job that churches should be comfortable with or want. The work of churches should never be seen as a cheap alternative to the state’s. “All of us need to be changed morally from the inside and I don’t have a monopoly on any of that stuff and neither does the church,” she says. When the Church is practically living out the Gospel, faith becomes alive and our society is greatly blessed. God’s kingdom is undoubtedly on the move and that is surely a true sign of hope for us all. Thanks, Gillan. I’ve been posting briefly (on FB) on each of these reports as they’ve appeared; but it is very helpful to have them all gathered together in one place with some sensible comment & analysis.